With all the craziness going on in New York City right now you’d think there is nothing else happening. Well, I’m glad to say that there is more happening. Remember that countdown timer Canonical posted yesterday? Well, it wasn’t exactly for an HTC tablet (as cool as that would have been) but the company — which makes the Linux distribution Ubuntu — has some exciting news regardless. Ubuntu for Tablets has been introduced, and it’s an implementation that has been built from the ground up with multi-tasking in mind. The biggest feature to drive that point home is SideStage. With it, you’ll be able to pull up the phone interface of an app from the right edge of your display so you can use it while doing something else. For instance, I could be Skyping with my friend on the left, and have a smaller pane offset to the right for checking Twitter. SideStage can come in as an overlay or as an adjustable split-screen item, not unlike the implementation you’ll find on Samsung’s Galaxy Note devices or on Windows 8 Pro. What’s even cooler is that the tablet app in SideStage can automatically flipped over to the phone part, and the user interface will change accordingly (assuming there’s a phone interface for that particular app baked in). In the video above, Canonical shows how you can converge the various aspects of your computing life with one seamless experience. Dock your phone with your tablet, and you’ll be whisked into the tablet interface while your phone apps continue running off to the side in Side Stage. From there, if you were to connect a keyboard and mouse to the tablet you can use the full Ubuntu experience as you would on traditional desktops and laptops. Then, take your remote and turn your television on for that same Ubuntu experience on the big screen. So why is this so important to Android? Well, those of you who own the Nexus 7 and Nexus 10 will be able to see how this works for yourself once Canonical brings out working preview code for those devices this Thursday. It’s a nerd’s wet-dream come true, and we can’t wait to see how this all pans out. Watch the video above, and read on for full press details. Canonical today presented Ubuntus tablet interface — the next step towards one unified family of experiences for personal computing on phones, tablets, PCs and TVs. Edge magic for cleaner apps: Screen edges are used for navigation between apps, settings and controls. That makes for less clutter, more content, and sleeker hardware. No physical or soft buttons are required. Its pure touch elegance. Visit us at Mobile World Congress: Booth Number: 81D30, App Planet Hall 8.1. 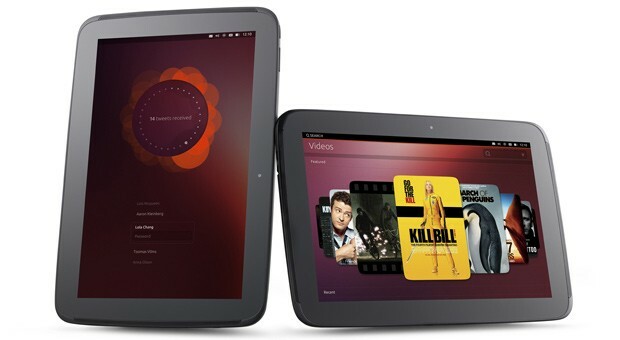 The Canonical team will be available to install Ubuntu on your phones and tablets at Mobile World Congress. Note: Ubuntu Touch Developer Preview is a developer build and not a consumer-ready release.